TourGuideTim has the best tour guides in San Diego. Our guides are passionate about San Diego, have the most in-depth knowledge of the area, and know how to share stories and experiences in an entertaining manner that you will remember for a lifetime. Join us for a public tour or hire us for a private tour of any size. Meet fellow travelers by joining a small public tour limited to 20 guests. Our bus tours of San Diego also provide guests the best opportunity to ask questions and interact with their guide because we are the only San Diego bus tour company to provide both a professional driver and an expert tour guide on each tour. Our Coastal San Diego Tour to La Jolla and Torrey Pines is a city tour in the truest sense. Other tours in San Diego focus on taking guests from their hotels to the attractions surrounding downtown San Diego. Our San Diego tour takes you out of downtown San Diego to see the coastal communities where the locals live, work and play. We’ll show you the most beautiful area of Southern California with the most expensive homes and share with you American innovations developed by the bright minds attracted to this area making it one of National Geographic’s Smart Cities of the World. 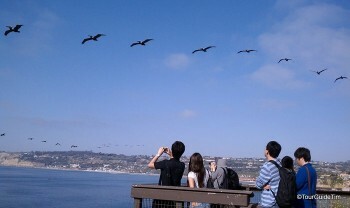 Learn more about our public Coastal San Diego Tours. For those who want the privacy of their own tour or would like a customized tour of San Diego centered around a particular area of interest or in a foreign language, TourGuideTim has extensive experience to make sure you or your client get the best tour service available. We can arrange the appropriate sized vehicle and an expert guide that best matches your interests. Or, if you have your own vehicle, we are happy to provide just the guide. Learn more about private tours of San Diego. Are you arranging a group tour for a reunion, company meeting, or other purpose and want a tour company that is responsive and easy to work with to make sure your group has a great all around experience? Are you looking for ideas on other activities you could incorporate as part of a tour? 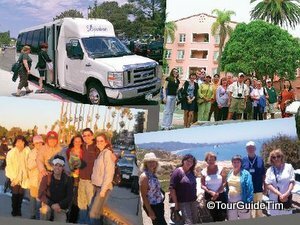 Learn how TourGuideTim has helped others with their group tours in San Diego. Helping guests find the perfect spots to enjoy everything San Diego has to offer. San Diego is known for its great weather but what makes it stand out as a special place for tour guides and anyone else who lives in San Diego is its variety of life. San Diego County encompasses all types of natural environments from the Pacific Ocean to the canyons and mesas, valleys and hillsides, to our mountains and desert all within easy reach of a wonderful metropolitan city. This provides an unparalleled opportunity to see and experience all types of climate zones, topography, plants, trees, wildlife and more in just one day. This variety of environments has attracted innovators, wealthy donors, the military and more allowing us to provide you tour experiences that you would not be able to experience anywhere else. Learn more about our specialty tours in San Diego. 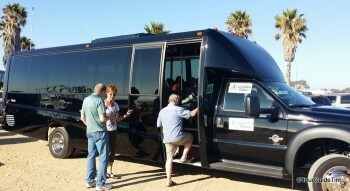 After years of experience organizing private tours for local groups, TourGuideTim launched a public tour of San Diego in June of 2010, which quickly ranked as the best bus tour in San Diego on TripAdvisor and continues to receive recognition, such as Viator’s ‘Best Local Operator 2014′. We look forward to providing you a memorable experience of San Diego. Get a taste of what we can offer…Book a reservation through Zerve for our Coastal San Diego Tour or call 1-858-412-0846.